After the final phase of the campaign in November 1916, military operations by both sides were mostly restricted to survival in the rain, snow, and shell-holes. The army was ordered to keep German attention on the Somme front, by making localised attacks to deflect attention from preparations for the Allied offensive at Arras, planned for April 1917. During one of these operations, Driver Tom Beesley died of wounds on 13 January 1917: “Driver Beesley was engaged with a fatigue party near the trenches, on the return journey a shell burst near the party, and mortally wounded ... He was buried the same afternoon in a military cemetery”. His grave marker must have been lost in later fighting as he is commemorated on the Thiepval Memorial to the Missing. He was probably the first conscript ? but certainly the first member of the local Church Lads’ Brigade ? to lose his life in the war. Large scale operation on the Somme may have petered out because of exhaustion and the winter’s rain but in Mesopotamia [Iraq] conditions were ideal for fighting and the British Army under new General Maude were determined to avenge the disastrous surrender at the fortress of Kut at Easter 1915. Troops had been brought from Gallipoli after they had been evacuated – Tewkesburians served with the 7th Gloucesters: L/Cpl. 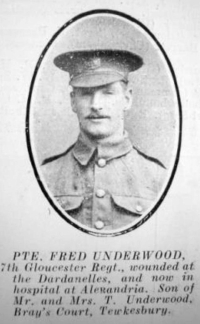 Fred Underwood had been the second Tewkesburian to win the Military Medal. Driver Albert Cleal, however, was the first to die in this campaign. Serving with the Royal Field Artillery, he had died on 19 July 1916 but it was not until the Register report of 9 December that it was learned that he had “died of disease”. By the end of August 30,000 sick had been evacuated. The counter-attack waited until the night of 13/14 December 1916; 50,000 men were involved in the advance. Progress was slow – if sure – on account of heavy rain and an overriding concern to minimise casualties. L/Cpl. A.G. Taylor of the 7th Gloucesters was the first to be killed on 15 December 1916 with Pte. N. J. Mann, 9th Worcesters, the next day, right at the start of the attack. Success did not come until the capture of a fortress on 29 January 1917. By this time conscript Pte. H. G. Rowley, 7th Gloucesters, had been killed on 15 January. Conscript replacement Pte. Clarence Howell, 9th Worcesters, followed on 25 January, and then Pte. J.J. Parnell, 7th Gloucesters, on 10 February 1917. 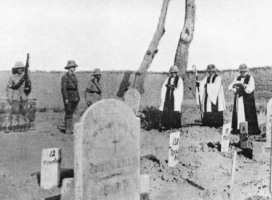 The bodies of Taylor, Mann and Howell were neither recovered nor identified; only their names are, therefore, commemorated on the Basra Memorial, along with 40,000 other Commonwealth soldiers. Rowley and Parnell were buried in Amara Cemetery, next to which was a hospital - so we can deduce that they died of either wounds or disease. None of these men were able to participate in the fall of Baghdad on 11 March 1917 when, at last, the Mesopotamian adventure seemed to be paying dividends. 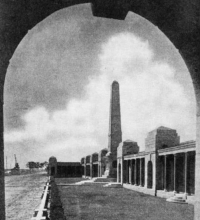 However, the fall of Baghdad coincided with increased concerns about oil supplies – to the north at Mosul and, indeed, the oilfields of Baku on the Caspian Sea, which caused the loss of life of another Tewkesburian in 1918. Explorer Gertrude Bell: “And that’s the end of the German dream”.